On a trip into town when all I was supposed to get was was new socks and toothpaste but I ended up leaving with three new palettes the Berry Velvet, Soft Camo and Peach Dream palettes which all have 9 different shades with a mix of shimmer and matte shades all for only £3 each! 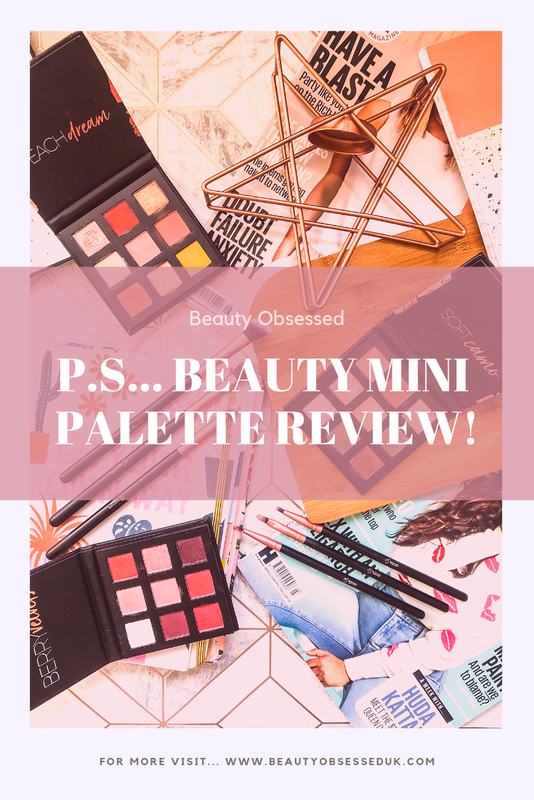 In this post, I will be reviewing each of the palettes with an eye shadow look each. I had no intention at all to go over to the beauty stands in Primark because I know that when I do I always end up leaving with something and I proved that again by getting these palettes. There were a few more variations of this palette but I ended up getting three different ones with all different shades like the Berry Velvets, Soft Camo and Peach Dream. As soon as I saw these palettes they instantly reminded me of the Huda Beauty Mini Palettes that I see everyone using on Instagram but these ones are way, way cheaper. For all three of these palettes, it only cost me £9 and even though the pan sizes are particularly small I think you will still get quite a bit of product out of the palettes. The packaging for each of the palettes is pretty similar instead of the photos on the front. All of the palettes are made with cardboard and paper and have a magnetic clasp to keep the palettes closed. The packaging itself is very nice and even though it can be made better with the added benefit of having a mirror, you can't expect too much because of its very cheap price tag. On the back of the packaging, you also have all of the ingredients labelled as well as the product amount. The product amount of these palettes are labelled a little differently than other palettes that I have, it's labelled as how much product is in each individual pan. There are 9 pans in total in each of the palettes and they all have 1g or 0.03Oz of product. I compared this to a MAC palette that I have which also has 9 pans for eyeshadow but this palette has 5.85g or 0.20Oz of product altogether. I worked it out that the P.s palette has slightly more product than the MAC palette but, not anything significant. 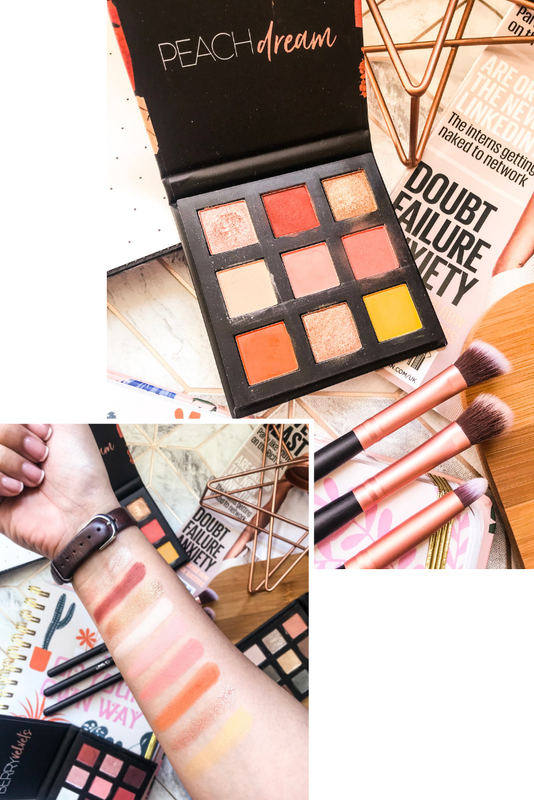 The Peach Dream palette was what I was most excited about when I first saw them in Primark because the shades were just so pretty and really perfect for spring. This palette has 3 shimmer shades and the rest of them are matte shades with colours ranging from yellow, orange and coral. When swatching the shades the matte shades came out really pigmented but pretty powdery and the shimmer shades applied slightly clumpy but still had really good pigmentation. The colours that swatched the best were Taupe (the third shimmery gold shade), Mauve (the second matte shade) and Posey (the sixth corally pink matte shade) and the shades that didn't swatch so well were Edge (the seventh orange shade), Sassy (the second from last shimmery rose gold shade) and Nectar (the last yellow shade). The look I went for to test out this palette was something very different to what I wear on a daily basis and for me, it is pretty daring. I also decided to do a cut crease which I sometimes find difficult but then I also love the look. When creating the look above it took ages and that wasn't because of the shades not working but I'm a perfectionist and I actually restarted the look a few times. 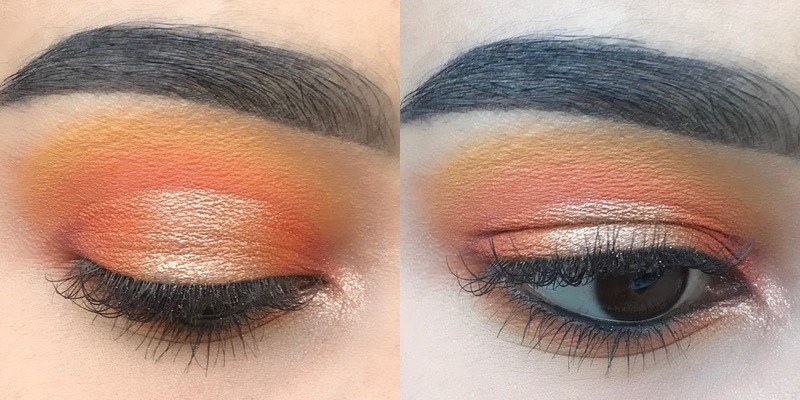 The shades that worked the best in this look was actually the Edge which is the orange shade that I was surprised about because it didn't swatch so well. Once the first two colours were finally blended into the way I liked it I then started the cut crease by just applying my Revolution conceal and define concealer. For the cut crease, I decided to add Sassy to the centre of my lid, I did this by using my finger as it added the best pigmentation. for the outer and inner corner, I went back to Edge and applied it with a blending brush, this is the part of the look that took the longest but I loved the finished look. 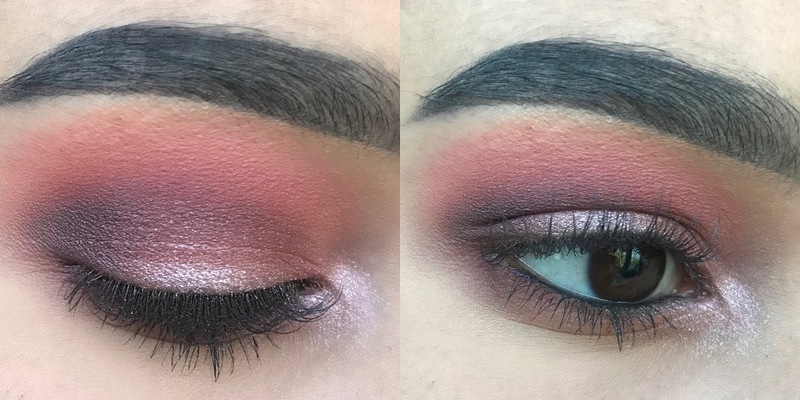 For this look using the Berry Velvet's palette I wanted to make it look a bit more wearable, and easier to do if you can't do a cut crease (which I've only just learnt how to do properly myself!). This look I was going for was more of an evening on a night out with the girls! For this look, I realized that the more red shades didn't work as well as I wanted to so it looks a little longer than I would have hoped to get the look the way I wanted it too. For this look, I used most of the shades as a few of them like the Desire and Wild Hearts which are both red shades weren't as pigmented as I would have liked. 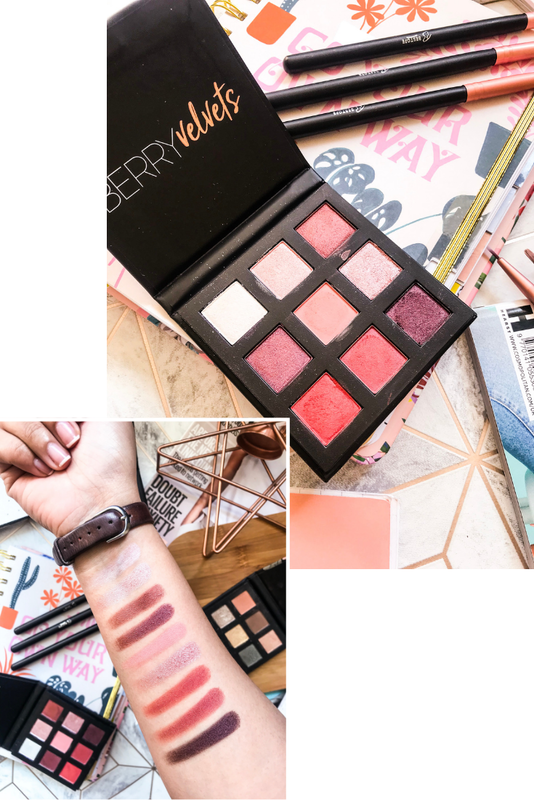 To start the look I applied Sweetness which is the only matte shade in the palette, this colour is the perfect pinky shade for this look. To darken the crease shade I then applied Selfish and Tough Love which are deep purple shades with a hint of glitter but nothing too overpowering, this colour actually blended really easily into the pink shade. I then applied Crush and Hubble which are the light pink shimmery shades to the lid and blended it out with my finger for the best pigmentation. The whole look took the least amount of time but came out really great. 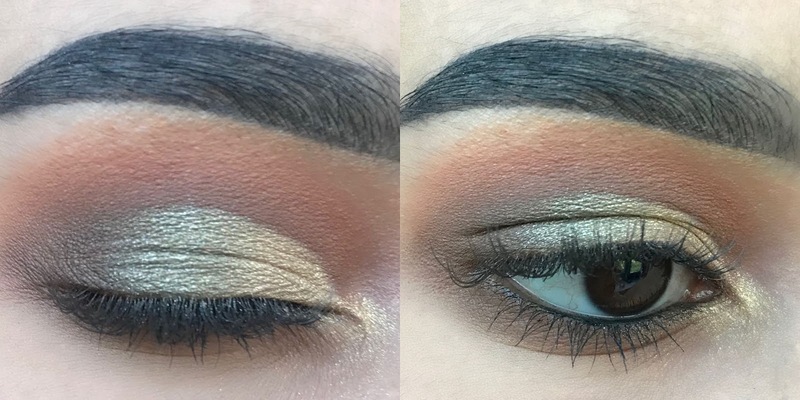 For this look I combined both of the techniques from the two looks above, I used concealer to cut crease but only halfway across my eye instead of the while lid like the first look. This look can be a lot more wearable and I've actually worn it for work a few times. 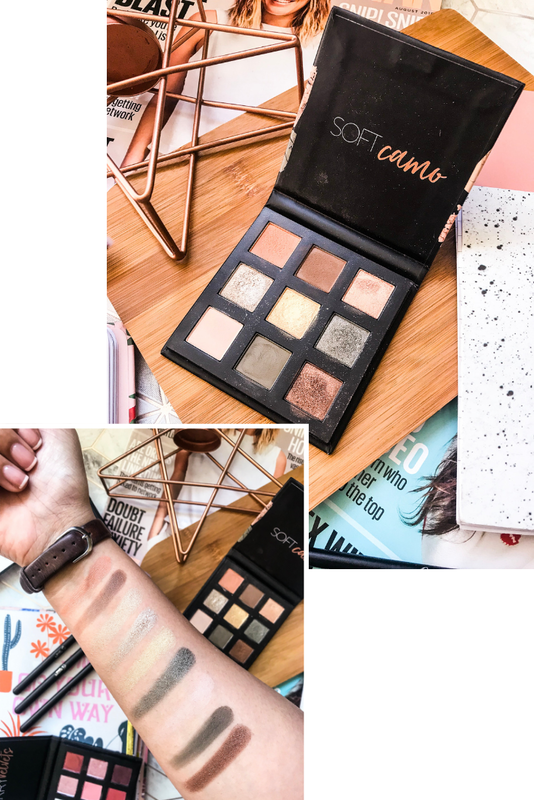 The shades in this palette all seemed to work really well together and I found they had the best pigmentation of all the palettes and they didn't have too much fall out which I found that the other palettes did. For this look I started by applying Creme which is the first shade into the crease, this applied like a dream and blended out so easily. Then to darken the crease I mixed Creme and Coco together which is a slightly darker brown shade which also blended out easily. Once the crease shade was how I liked it I then applied the concealer to the inner corner and stopped halfway. For the cut crease, I applied Sand which is such a pretty gold shade, I used my finger for the best pigmentation. I then blended Camo which is a really pretty shimmery green shade, the two shimmer blended well together but there was a bit of fall out. For the outer corner, I applied Glory which is a deep bronze shade, this shade wasn't as pigmented but layering the shade worked the best. For the inner corner highlighter, I applied Suede which is a mix of gold and silver. Overall I really enjoyed using these palettes, they worked really well and I was able to create really lovely looks. For this price, I would definitely recommend trying them out and because they are really compact I think they would be perfect for travelling. Primark has really upped their game recently with their new releases and product launches. Have you seen these palettes before? Don't forget to follow me on social media for more blog updates! Those looks you created are SO pretty, I particularly love the peachy ones! I don't think I'd have expected these to be from Primark if you hadn't mentioned it! Oh my gosh Aaliyah, these looks are GORGEOUS! The peach dream one is probably my favourite, those shades are to die for. The pigment, blend-ability and price point seems absolutely perfect. You're absolutely right that they would be amazing for travelling. You've completely sold these palettes to me, I hope they have some in my local Primark the next time I pop in! I was so impressed with the PS palettes! I got one in a subscripion box and was impressed with the blending and how gorgeous they looked on the eye! I have one of the Huda palettes and I totally agree they're such a strong dupe! I love the looks you've created and the colours look pretty pigmented actually- I'd never think they were Primark. It's crazy how you've got all three for cheaper than one Huda! gorgeous photos!!! I think the makeup it looks cool and pretty in your eyes, i prefer red and purple jaja, but orange is a very nice tone. I've not tried these, but after seeing your review and the gorgeous looks you created I'm going to try and pick at least one up. Thanks for sharing.